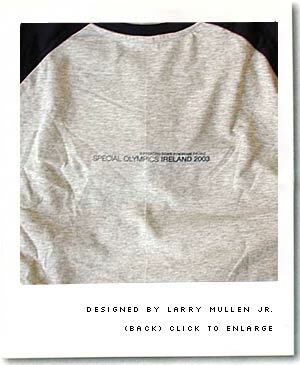 Fresh from Dublin’s Brown Thomas, the T-shirt designed by Larry Mullen for the Special Olympics Ireland, 2003. 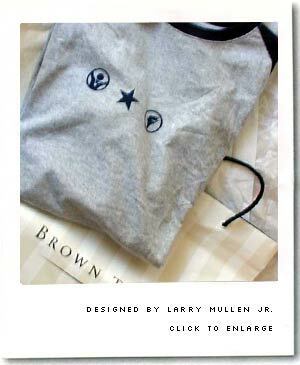 Two other designs are available, one designed by Samantha Mumba and another by Andrea Corr. We were unable to trace Ali Hewson’s handbag for certain, but a poster in the shop revealed a photo taken from above of two kids swimming. Right on Larry. That’s mighty cool of ya to help the less fortunate. I can honestly say more respect has just been earned. Rather than babbling on and on, as I often tend to, just wanted to say that is a very considerate gesture.